Make the most of every minute in St. Petersburg with a comprehensive, two-day tour delivering the best this beautiful, historic city has to offer. Tour magnificent czars’ palaces, exquisite gardens, the world-famous Amber Room , the iconic Hermitage museum, onion-domed churches and so much more — up to nine stops total. You’ll also spend more time ashore, 10 hours per day, with a delicious, typical Russian lunch. What’s more, two well-informed, engaging guides join each bus, imparting their knowledge of the area as well as its rich history. DAY 1 Begin with a cruise of St. Petersburg’s waterways, passing magnificent palaces, mansions and cathedrals. 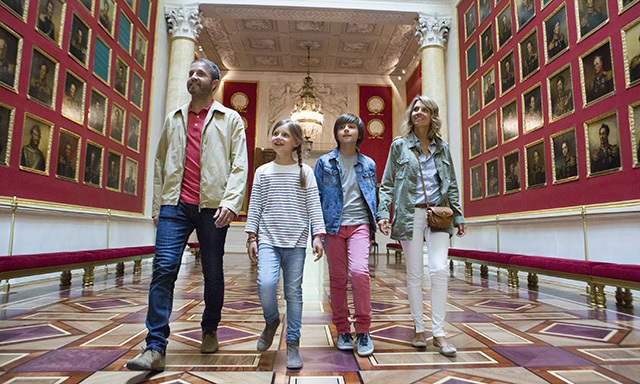 Then explore the inside of Yusupov palace, one of Europe’s most lavish estates. This huge riverside was home of the Yusupov family, as wealthy as the tsars in the 19th century. Tour their grand halls, art collection and an exhibit about the 1916 palace murder of imperial advisor Grigori Rasputin. After, pay a visit to St. Isaac’s Cathedral to marvel at the dome decorated with 200 pounds of gold. Its vast interior is filled with hundreds of impressive 19th-century works of art. After a multicourse lunch at a local restaurant, venture deep inside the Hermitage, housing 3 million-plus items. Continue to the Church of Resurrection on the Spilled Blood, a spectacular, Russian-style multicolored, onion-domed church. DAY 2 Discover Catherine Palace in Pushkin, one of the most splendid summer residences of the Russian tsars and considered one of the masterpieces of world architecture. Marvel at the grand halls and private chambers. The Amber Room was once dubbed the “Eighth Wonder of the World.” Then stroll the exquisite gardens, 1,400 acres dotted with charming pavilions set around the central lake. After a typical multicourse Russian lunch at a local restaurant, venture to Peterhof, one of the summer residences of the royal family. A UNESCO World Heritage site, Peterhof is located 18 miles away from St. Petersburg on the Gulf of Finland. Tour immense terraced gardens featuring sculptures, numerous pavilions and intricately shaped foot-bridges. See more than 150 fountains and four cascades — all gravity-fed. Imagine the sun intermingling with the thousands of water sprays, revealing all colors of the rainbow. Don’t miss the famous baroque Grand Cascade, with its three waterfalls and an avenue of fountains and gilt statues. Then drive across the Neva River and view the Spit of Vasilievsky Island, flanked by two rostral columns stopping for a tour of the early-18th-century Peter and Paul Fortress. Within the fortress is Peter and Paul Cathedral, an ornate 18th-century church situated at the highest point of the city and also the burial place of the tsars. • Multiday comprehensive tour: See the best St. Petersburg has to offer on a fully guided discovery of this exquisite city. • The Hermitage: Founded by Catherine the Great, the museum houses 3 million-plus items, including the world’s largest collection of paintings. • Peterhof: Fountains and cascades abound in the immense terraced gardens; the Grand Cascade’s powerful jets form a majestic, crystal-like colonnade. • Free Time: Enjoy about half-an-hour on your own to shop for gifts, souvenirs and other treasures in one of the recommended souvenir shops. • This tour is strenuous. Guests must be able to walk long distances over varied surfaces and negotiate many steps. • Guests in wheelchairs and others with limited mobility should not select this tour. • Guests must bring their passports and tour tickets to pass immigration control. • Guests with dietary restrictions can order an alternate meal with 24-hours advanced notice. • Flash photography is restricted in certain areas of the Hermitage Museum and Catherine Palace. Photo and video are prohibited inside the Amber Room. • Tour doesn’t include an inside visit to the Grand Peterhof Palace. Tour sequence may vary. • This tour is specially designed to be conducted in smaller groups with 2 guides in each bus. • Museums may change their exhibitions or close some halls without prior notice.